Led by an ex-KGB spymaster president, Russia's kleptocratic government is very good when it comes to controlling the Grey Zone operations, which usually concern themselves with shaping the opinions of the public-at-large ahead of armed conflicts. Grey Zones are part of the five terrains of warfare : land, sea, air, space, and now cyberspace, where those Grey Zone operations may occur. In modern politics, 'Truth' is now more than ever an outdated concept, buried in layers of dezinformatsiya, hiding secret agendas. Truth went out the same way as curb feelers did. So, logically, it follows that nobody lies anymore, doesn't it? This last statement would seem like a welcome relief for one of our existential anxieties, that of being caught believing in lies. Except that if nobody lies anymore, it's because we're now deep inside 1984 territory. So get ready to experience a new, a different kind of anxiety. Nobody lies, they 'misspeak'. Or, if 'misspeaking' is too risky, they have 'memory lapses', any number of them. Or everybody misunderstood what they really, really, really meant. And if they break the law, they claim ignorance of the law, or that someone else goofed. Or they plainly tell you some of the truth, but skewed to serve their purposes. The US, like any other power throughout history, is also making use of dezinformatsiya and therefore is also fooling around in the Grey Zone. A few years ago, this writer had acquaintances who emigrated from Venezuela that told him of the dire conditions in their home country under Maduro's oppressive, authoritarian, right-wing type of socialism. Back home after work, he had to dig a bit in the news to find out that it was all true. This digging has become progressively harder now, with Trump's war on information. Harder still nowadays is immigration, because of his hard line anti-immigration policies, even as he talks up “humanitarian” intervention in Venezuela. Those Venezuelans told me of the dead and dying that are stacking up – and stinking up – hospital corridors, of shortages of everything, most importantly food and medicine but also, most insultingly, toilet paper. To keep the people in line, only the police, the army and the colectivos have access to enough rations in order to feed their families, as a way for Maduro to buy their fealty. Aligned with Maduro, the colectivos are civilians who stand ready to dispense violence and death as soon as a whisper of dissent is heard, or a demonstration begins. Human Rights Watch described colectivos as "armed gangs who use violence with impunity". So at first there was indeed joy for some at the prospect of someone throwing Maduro out. You see, Trump, a living example of the Dunning–Kruger effect who is well known for appointing crooks to government positions, chose a very special kind of man to be U.S. Special Envoy For Venezuela : a man with an ominous past named Elliot Abrams. 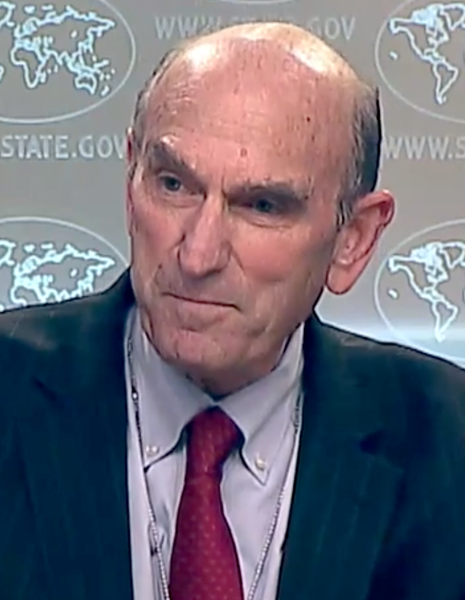 The “Honorable” Elliot Abrams, according to the title card on his desk. Why have those pesky quotation marks been slapped on his “honorable” title? Maybe because he was convicted for his part in the infamous Iran-Contra affair, that's why. He lied to Congress in order to help the Contras, who were a terrorist paramilitary force that regularly murdered civilians. Abrams, who looks and acts the part of the Grinch who stole Christmas, was convicted on two misdemeanor counts of unlawfully withholding information from Congress, was pardoned by H. W. Bush and then went right back to his old dirty tricks by becoming “a key architect” behind the Iraq War while working for George W. Bush's administration. Something about this just didn't pass the smell test. Maybe, well... maybe this note didn't express his desire to give 5,000 troops some R&R in Columbia where the women are beautiful and the cocaine is dirt cheap if you happen to know the right cabron. Actually, it's easy to deduce that Bolton wanted that menacing statement to be picked up by the press, and knew full well that reporters would broadcast it for him. The note was scribbled with a thick, sharpie style black pen in aptly large script, all alone at the top of a yellow pad he held over his arm, all strategically readable. But the fact that this dumb maneuver could easily be denounced for what it is does not matter to a certain crowd. Bolton got his message out there, he created the moment, he created that news bite, and now it's flying around in the zeitgeist all by itself. To him, that's all that counts. When you start looking through that looking glass though, you just can't stop! John Feeley, a retired US Ambassador to Panama and Marine Corp officer, in an article about dezinformatsiya on the Internet, tells us about the picture of an American admiral said to be inspecting Venezuelan troops, when in actuality he was inspecting troops in El Salvador at an unrelated event. There's also a picture of army and Marine troops assaulting a beach, protecting a humanitarian convoy, and more, all false. Venezuelans are a very resilient people, but they can fall prey to dezinformatsiya just as easily as anyone else, maybe even more so because of the dire circumstances they're living in right now. Ambassador Feeley says that Bolton's attempt at this dirty trick “... tracks with his career modus operandi as a smug and self-appointed crafty Cold Warrior and neocon.” So as soon as he saw an opportunity to push his warmongering vision, Bolton jumped. Even Pence crawled out of his cardboard box to wade in on that dezinformatsiya fantasy! Careful editing of the footage shown as proof seems to show that the security forces caused the fire, but even more careful examination of unpublished, unadulterated footage of the event by the New York Times tells a different story : that nobody in the Maduro camp was responsible for burning the supply truck. Even the American organization that sent those supplies said that there was no medicine on the trucks, only food and some medical supplies like masks and gloves. However, Bolton's lies are still out there, making the rounds, becoming a predictable proportion of the public's truth. A truth they will then defend with all their might, and beyond. And that's the power of dezinformatsiya! All this brain scamming points to an imminent planned military invasion of Venezuela, and sometimes goes as far as treating it like a fait accompli. On top of all that dezinformatsiya, Trump allowed himself to be more direct. He said that the use of US military force in Venezuela is still on the table. "We’re here to proclaim that a new day is coming in Latin America, it’s coming." Nobody's hands are clean in this affair. When the oil prices picked up in the early 2000s, Chavez sought to take care of his people with ill-thought-out plans that were unsustainable and made a wreck of the Venezuelan economy. His successor Maduro inherited this wreck and used just about every means at his disposal to keep himself in power. While people paid for groceries with stacks and stacks of near-worthless bills (reminiscent of post-WWII Germany), Maduro donated $500,000 for Trump's inauguration festivities to buy himself some peace as he ran his own dezinformatsiya campaigns, dangled the promise of rations in exchange for votes to famished voters and other, assorted dirty tricks. But the most disgusting of his sleazy moves concerned his Cuban doctors — and even fake doctors — that he tasked with drumming up support for him. Maduro secretly made his imported Cuban-trained doctors deny treatment to supporters of the opposition, or play mind games to get elderly patients' votes, warn chronic patients to vote for Maduro or their health benefits would get cut off, and more, and worse. Stuck between a rock and a hard place and ethically challenged, many of those Cuban doctors came forth under cover of anonymity to denounce this sad state of affair, or simply defected. This isn't just another hastily cooked up, semi-intuitive, harebrained plan of Trump's. On page 136 of ex-FBI director Andrew McCabe's book The Threat, whom Trump fired out of spite mere days before he could get his government pension, he tells us of a meeting he attended in July 2017, where Trump astonishingly told his PDB (President's Daily Briefing) briefers that he believed Putin's word over that of his own intelligence personnel's concerning North Korea. We believe that at this time, it would be appropriate to mention that never has a president been voted out of office during times of war and unfortunately, it looks like somebody has told Trump. In order to “legally” invade Iraq, possibly to give itself some peace of mind and room to move, the US government invented the AUMF, the Authorization for Use of Military Force resolution. It's been using the AUMF ever since to invade countries for its own, sometimes... varied purposes. Unfortunately, that Politico article does not say whether they also took down the American government’s dezinformatsiya accounts, or if this move will really be effective, but even the Red Cross refused to help in the Venezuelan crisis, saying that the whole problem was “politically motivated.” One feels compelled to wonder whether even the Red Cross has its own intelligence network. Representative and antiwar presidential candidate Tulsi Gabbard is the most shining example of that pushback against her own government's dezinformatsiya. She was invited on many television news shows, and also The View, where she talked about her own views concerning American militarized invasions, their pointlessness, waste, and their especially deleterious effects on the invaded countries. It wasn't pretty, but after being attacked on CNN and on NBC's Morning Joe, she was as ready as ever for The View. She didn't even show contempt for Meghan McCain's usual patented gormless attacks. Tulsi Gabbard has all kinds of gumption. Gumption : Tulsi's not afraid of following in the footsteps of Professor Jeffrey Sachs, or even Phil Donahue, who was fired from his own TV show because he opposed the imminent U.S. invasion of Iraq, making him a "difficult public face for NBC in a time of war." Never afraid to live up to her convictions, Tulsi even resigned from the DNC to endorse Bernie Sanders. Gumption : She is a Major in the Hawaii Army National Guard and was assigned to two tours of duty at a field medical unit in Iraq, and then went on to serve in Kuwait. Somewhere along the line, she must have learned how to keep a cool head under duress because she answered all the major station corporate drones' borderline insulting, demeaning, red baiting questions with exemplary calm and levelheadedness. The democratic party establishment's experts must have prepared that list of questions and distributed them to her 'interviewers' in order to trip her up, because those questions were mostly the same. The corporate drones even went as far as to tell her that her criticism of America's wars meant that she thought her co-combatants fought and died in vain, and that she thus let them down. They did not get her goat. In early may 2012, a terrorist who was in-line to become a suicide bomber was assigned to bring a bomb aboard a plane and detonate it in mid-flight killing all aboard, himself included. But the attack did not succeed. That's because the terrorist that Al Qaeda had chosen to be the suicide bomber was in fact a spook for the opposition.